Merger and Acquisitions Service in China 1. 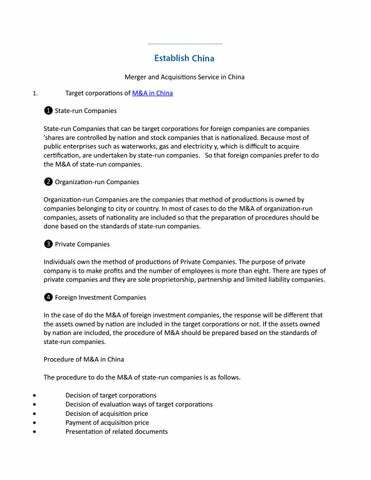 Target corporations of M&A in China ❶ State-run Companies State-run Companies that can be target corporations for foreign companies are companies ’shares are controlled by nation and stock companies that is nationalized. Because most of public enterprises such as waterworks, gas and electricity y, which is difficult to acquire certification, are undertaken by state-run companies. So that foreign companies prefer to do the M&A of state-run companies. ❷ Organization-run Companies Organization-run Companies are the companies that method of productions is owned by companies belonging to city or country. In most of cases to do the M&A of organization-run companies, assets of nationality are included so that the preparation of procedures should be done based on the standards of state-run companies. ❸ Private Companies Individuals own the method of productions of Private Companies. The purpose of private company is to make profits and the number of employees is more than eight. There are types of private companies and they are sole proprietorship, partnership and limited liability companies. 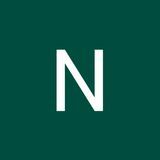 ❹ Foreign Investment Companies In the case of do the M&A of foreign investment companies, the response will be different that the assets owned by nation are included in the target corporations or not. If the assets owned by nation are included, the procedure of M&A should be prepared based on the standards of state-run companies. Procedure of M&A in China The procedure to do the M&A of state-run companies is as follows. Laws and regulations related to M&A in China M&A in China relates to many laws and regulations so that it is significant to understand these laws and regulations. The main laws and the contents of laws are as follows.       2. Foreign regulations*** Guidelines of Foreign Investments Directions Corporation laws***Companies Act; Management Act of Joint Venture; Corporation Act of Joint Venture; Regulations of Foreign Investment Owned Taxation***Income Tax Act of Corporation; Stamp Duty Act; Taxation at Source Act Monopoly Prohibition Act Financial and securities***China Securities Act; Management Standards of Listed Corporation; General Meeting Regulations of Listed Corporations China Labors Act Methods of M&A in China ❶ Purchase of shares or ownership This method of M&A means foreign companies purchase the shares or ownership, or undertake the capital increase of target companies. As a result, target corporations will change to foreign companies. ❷ Purchase of assets First foreign companies set up the foreign investment companies and then the assets of local companies will be purchased by foreign companies and to be managed. Another way is that foreign companies purchase assets of local companies first and then set up corporations by using the assets. No matter which method foreign companies will use, there is limitations related to M&A. For example, if foreign investors acquire the right to control the target corporations, and the companies are recognized that it is a significant industry for country and it will influence the national security, it is necessary to declare to the Department of Commerce. Estimation of valuation of target corporations Price negotiation with target corporations Response to financial due diligence with a project team To learn more about our incorporation assistance and a range of services related to M&A in China, send us a message or call us at +81-3-5369-2930.